What does a superhero look like? Do they have to wear a uniform and a cape? 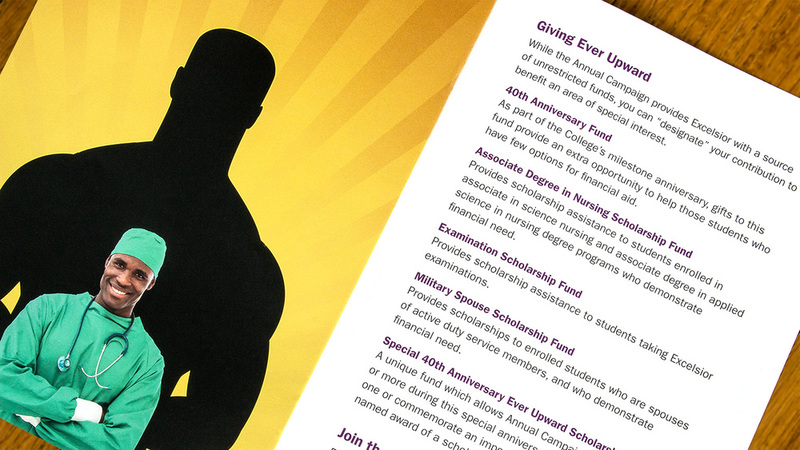 Panarama Design said “no” in designing this direct mail fundraiser. Instead 4 actual Excelsior students were spotlighted by a dramatic superhero stance demonstrating that Excelsior graduates undertake heroic efforts to earn their degrees. Panarama Design also designed the Everyday Hero logo used throughout the campaign. Panarama Design has always been my go-to agency when I need something creative, thoughtful, and affordable. Lauri's keen insights have added value on every project we have undertaken together. Most importantly, her work has had the desired impact. Whether it is increasing event registrants, growing contributions, or deepening a brand platform, Lauri has always been a good partner. "